Today: Managed to visit the prologue and four chapters of Part One and made lots of changes even though they’ve been worked over many times. However, I’ve decided those five segments are now cooked enough. Will see what tomorrow brings. Weekend: I did no editing over the weekend as I promised myself and felt fresher for the fray today. So days 55 and 56 were spent reading, the inevitable shopping / cooking chores (that’s right I’m a reluctant housekeeper and all that goes with that), and mulling over a lifetime of photographs (I have a family photo-book project in mind). It will be fun selecting from and scanning long-ago pictures. I found so many forgotten memories; very nostalgic and story fodder for the future. Reading: Michael Collins book, the keepers of truth is more vicious in parts than I expected from the blurbs and the first few pages. Not my usual fare, but I’ll stay the course, the writing is outstanding. I’m sure the Booker Prize judges will be pleased I agree with their opinions. Also finished a couple of other books. First Battlelines by Tony Abbott, which I enjoyed – it reminded me of frustrations when working in the Commonwealth Government about the complexities of the federal system and the buck-passing between Canberra and the states and the impossibility of achieving better than a compromise that didn’t really serve the needs of the nation. I wouldn’t have missed that experience although it was tough to deal with, during eight over-worked years that included elections and the breaking up and merging of departments will all the possibly unwarranted costs of that and the resulting overlap of responsibilities that were seldom sorted out amidst the volume of other priorities. Oh, and the onerous burden of managing poor performers who should never have been selected! The other book is titled In search of my father: Dementia is no match for a daughter’s determination by Helena Popovic. It would be of interest to many beginning to cope with family members with dementia. I read parts of it and scanned the rest with a view to discovering new material as I’ve read much on the topic in recent years because of experience with two elderly relatives with Alzheimer’s Disease and another with a brain tumour. I didn’t find anything new, but the book provides many examples and explanations about recent research that helps to ward off both mental and physical deterioration. Developments around neuroplasticity are well outlined. Saga editing: Late start because of accompanying a relative to a medical appointment – always delays. Continued focus from yesterday. I breezed through two chapters making only minor changes, then got badly stuck on the next two. I immediately recognised the problem with both – they haven’t received any attention after the first draft which was written in haste with the intention of ‘getting it down’. I’m wondering how many more are in the same state. So, handicapped by a nasty migraine and some dullness from having taken a couple of Panadol, I made do with identifying where the problems are with colour highlights and suggestions, but did not feel clear enough to tackle them in detail. In the first awkward chapter I need to work on capturing the flavour of Freya’s friendship with Dora, a Dutchwoman undertaking a different nursing course from her own at Edinburgh University. Although clear in my thoughts, it does not leap from the page. Important to get right as the pair meet again in dramatic circumstances at the end of Book Two, and again in Book Three. I’m feeling a bit handicapped as I still haven’t found fitting working titles for any of the three books since deciding to carve up the whole saga. In the second problematic chapter the issues are similar – mainly the need to bring more energy to the interaction between two very different people. Back in Australia, Alexander’s new friend, Tony Bolton (mentioned yesterday) becomes smitten with Halima, a Muslim girl, but is only vaguely aware of the magnitude of cultural difference. Heartache is ahead for him. Will try one more chapter and then get out into the air before the rain returns in earnest. It was very heavy overnight. Later: The rain came and spoiled that idea. Overall, progress today was better than expected. Maybe the end of April deadline for completing the work on both parts of Book One before a final sweep in May is within reach still if I can substantially reshape around two chapters per day. 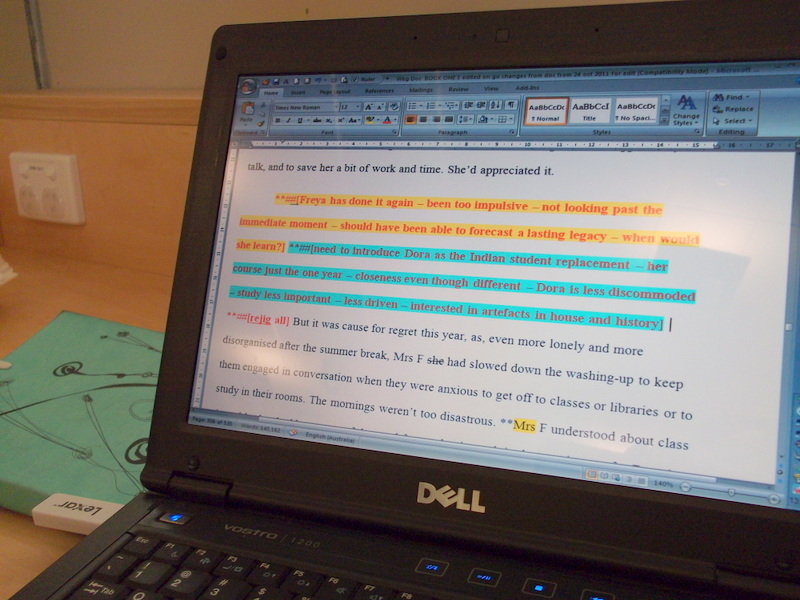 Saga editing: Another fruitful day, according to intention to focus first on progress in Part Two, I worked to the end of Chapter Nine, making similar changes as with weekend work – moving chapters, paragraphs and sentences around and tightening them. Have slight discomfort that the entry of a new character may seem abrupt – may change the beginning of that chapter. Freya is working in Glasgow again and attends a hospital class reunion with her friend Kirsty from Aberdeen. She accepts a new work challenge and has a well-earned holiday on Menorca. Alexander catches up with his sister who has been backpacking in Europe, and makes a new Australian friend who will play a significant part in his future. Around lunchtime I tackled that troublesome Part One chapter (now Chapter Seven), that sets the scene for upheaval for Freya. Deleted sizeable chunks and made other alterations to match. Next sweep should get it right. Anthology: Tabulated the stories by Writer’s Group members that I think are agreed for inclusion, wrote my bio, drafted an introduction, and collated copies of the stories I have on file (not complete). Will send to all by email for feedback and supply of outstanding stories. We need to manage the next part of the process online as several members will be absent from the next meeting. We have agreed a photograph for the cover, kindly supplied by the friend of one member. Next steps need us to supply individual photographs, and enlist the kind offer of help from one of the husbands to undertake the prescribed formatting. Short stories: Working on two at the moment – neither is gelling (is that grammatically correct?). First deadline is 15 May. 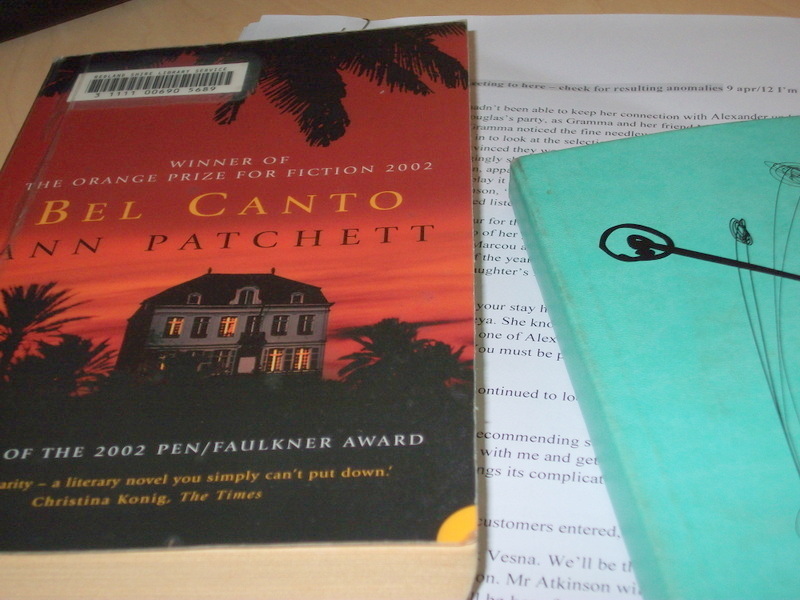 Reading: Continuing with Bel Canto. Still entranced.